One of the country’s biggest exam boards, OCR, has admitted to an error in Friday’s English Literature GCSE exam, taken by around 14,000 teenagers. The mistake related to a question on Shakespeare’s Romeo and Juliet in which the family background of a key character, Tybalt, was mixed up. It suggested he is a Montague when in fact he is a Capulet. The board apologised and said no candidates would lose out, but head teachers said the error was “serious”. Exams regulator, Ofqual, said the incident was unacceptable and that it would be “closely monitoring OCR’s investigation of how this incident occurred”. Geoff Barton, general secretary of the Association of School and College Leaders, said when candidates see errors in a paper it can undermine their confidence. He added: “Candidates have every right to expect that awarding bodies complete a full check on exam papers to ensure that they don’t experience such problems. “Similarly, schools and colleges have to pay thousands of pounds a year to examination boards and are entitled to better quality assurance than this. However, some students reacting to the exam on Twitter said that they had wasted time on the question, while teachers also spoke out. One pupil, Sophie Elder, 16, from Derbyshire, said: “I got to the question, I read it, and read it again and thought that doesn’t make sense. She added: “We had all tried so hard and made so much effort, and then for the board to mess it up, it’s just terrible. In a statement, the exam board said: “We’re aware of an error in today’s OCR GCSE English Literature paper. 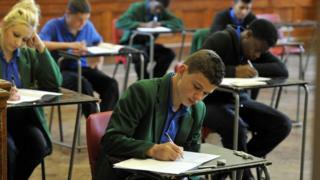 Russell Hobby, general secretary of school leaders’ union NAHT, said: “After two years of study it’s not acceptable for students to face such a basic error in their exam papers. “OCR are rightly apologetic but just exactly how they propose to mark this particular paper will leave many students, their schools and their parents with an anxious wait for their results.